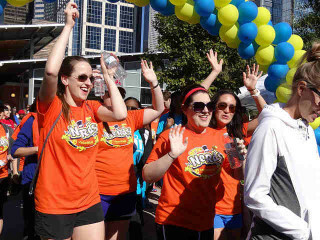 The Houston VisionWalk is a signature fundraising event of the Foundation Fighting Blindness, a 501(c)(3) tax-exempt organization. Over 10 million Americans are affected by blinding retinal diseases including macular degeneration, retinitis pigmentosa and Usher syndrome. The Foundation Fighting Blindness is working to find treatments and cures for these devastating diseases. By funding leading edge research in area such as genetics, gene therapy, transplantation, artificial retinal implants and pharmaceutical and nutritional therapies, the Foundation Fighting Blindness is making a difference today to make the world a brighter place for those suffering with retinal degenerative diseases.